In yet another special activity at the end of the first Arya Kshema Winter Dharma Gathering—and, taking place on the last day of the year according to the Tsurphu calendar—the Gyalwang Karmapa led a ritual that he himself had personally composed especially for the nuns’ dharma to flourish. 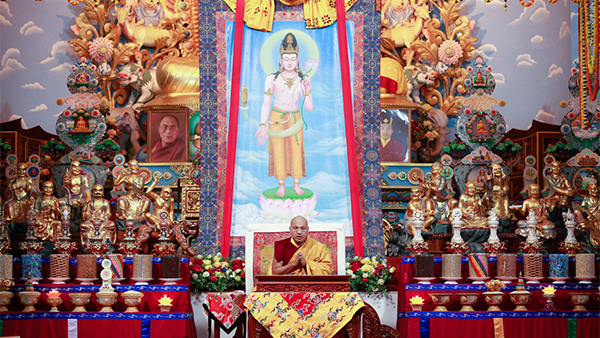 At this auspicious moment, when nuns in the Karma Kagyu tradition are stepping forward to more fully inhabit their valuable place within the sangha, and to take full advantage of the opportunities opening up for them, the Gyalwang Karmapa decided to perform this ritual so that the Buddhist teachings in general, and the community of nuns in particular can thrive. The ritual aims to dispel any harms, difficulties or obstacles to the nuns’ dharma, through powerful supplications to Avalokitesvara and the Buddha’s own personal attendant, Ananda. The Gyalwang Karmapa explained that the Buddha himself had said, in The Sutra of the Great Skillful Means of Repaying Kindness, that in the future when women monastics pray to Ananda, he will be able to protect them from harm and bring them great benefit. “We’ll do this ritual together now, and I hope that in the future it can also be done on a regular basis in the nunneries,” he said. He recommended that it could be performed in all Karma Kagyu nunneries particularly on the Sojong days that fall in the middle months of spring and autumn. The Gyalwang Karmapa composed the ritual based on texts relating to the Buddha’s own step-mother and disciple Mahaprajapati, the very first woman to request and receive ordination from the Buddha. After the Buddha had initially refused her request for women to become ordained as nuns, his attendant Ananda had interceded on their behalf and permission was later granted. The main part of the ritual centers around the Mahayana Sojong vows. After the opening Sanskrit prayers—led for the first time by female chantmasters or umzes—the gathered nuns, monks and laypeople kneeled on their right knees to repeat the liturgy for the eight Mahayana precepts after the Gyalwang Karmapa. The morning’s special practice also included supplications to Avalokitesvara, based on a sadhana by Nagarjuna called Sun of Avalokita 1000-Arms. In this practice Avalokitesvara and Ananda are seen to be indivisible, once more magnifying the power of the positive aspirations for the nuns’ dharma to flourish. As the ritual took place, a stunning thangka of Avalokitesvara hung behind the Gyalwang Karmapa’s throne, overlooking the gathering. Avalokitesvara was shown standing, with two arms, one holding a lotus flower in full bloom, the other in the mudra of generosity, with the Bhikshu Ananda emanating from his open palm—a visible image of their inseparability. To either side of the throne magnificent golden gilded statues of the 16 Arhats adorned the altars, together with sparkling gold and silver depictions of 16 auspicious symbols. With this special and historic ritual, the Gyalwang Karmapa once more demonstrated the fullness of his commitment to work for the welfare of nuns, and his aspiration that the nuns’ dharma may flourish.